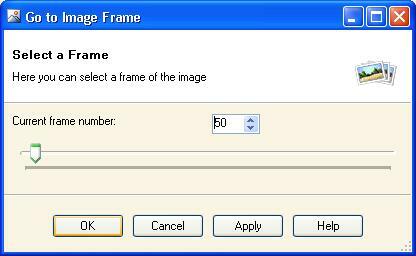 This topic provides a description of the controls on the Go to Image Frame dialog. To select a frame of the opened image click Frames>Go to... menu item from the View menu. This option is available only for multiframe images. Press Apply button to select a frame of the opened image. Press OK button to select a frame of the opened image and close dialog.